Many, many people absolutely hate this game. I can understand them - it really is frustrating when you're being endlessly ambushed by thousands upon thousands of enemies, dying in one hit, having only three lives and no continues. But with some practice - and a place to get infinite lives once every three levels - you can get very far in this game. Can't remember, but I probably got to Level 16 or so. But enough of all that rant, let's get it on with the review! Your name: Steve. 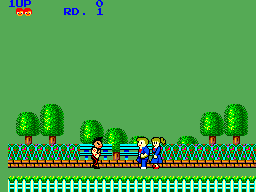 Your objective: Rescue your girlfriend from punks. The catch: There are thousands of them. The other catch: You'll never be able to save her since the game goes on forever (people said this game ends on Level 20, but on a forum I've seen a post where someone proved he got to Level 23). 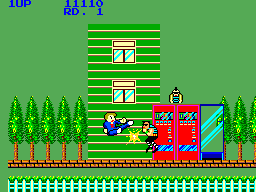 You fight through three different levels (yes, they repeat with the enemies and moving hazards getting increasingly faster) beating on thousands upon thousands of thugs until you finally make your way to the beach and take on the big bad one himself. There, each of you can take up to 10 hits before admitting defeat, and if you win, it starts all over again. This is also one of the game's weak points. The game didn't survive the port from the arcades very well, and the skies turned green. The backgrounds are pretty bland, too, but at least the sprites show some detail. The game has a total of 8 themes: Title, level, dead, Game Over, boss, beaten boss, level complete, girl taken away. Only two of them loop and neither goes for very long. And from dying a lot, the music that plays when you do die can get you furious. But still, the music does do a decent job. Controls are very responsive. And if you die, it's your fault for your less responsive reactions. Or because you just didn't have any time to react to the fast enemies. Or because some of the hazards shoot projectiles real randomly. But nevertheless, controls are very good. Button 1 jumps (and air-kicks), while Button 2, mixed with some D-Pad movement, performs three more different attacks: 2+Up performs a high kick, 2+Down performs a low kick, and just 2 performs a punch whose use earns you more trouble than it's worth, due to its short range. 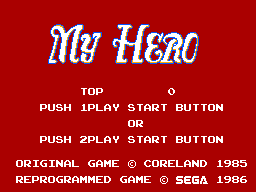 Unless you really can't deal with this game, "My Hero" will have no replay value for you. But maybe - just maybe - this game'll make you want more... More practice. Or perhaps more pain? Or more...? Well, I don't know what more it'd make you want. It's up to you. "My Hero" has got a mixed opinion amongst gamers. Some like it, some hate it. I count to the ones who like it. You all who haven't played it yet should give it a go, just to see whether or not you like it.